Be the first to share your favorite memory, photo or story of Margarette. This memorial page is dedicated for family, friends and future generations to celebrate the life of their loved one. 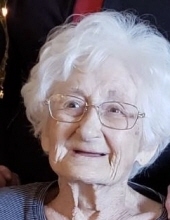 Margarette Elizabeth Smith Queen, 94, passed away December 4, 2018 at GHS Cottingham Hospice House. Born in Pickens County, she was the daughter of James Ivy Smith and Inez Chapman Smith Reed. She was of the Baptist faith and a member of Mountain Rest Baptist Church, where she held the honor of being the oldest member. In addition to her parents, Miss Margarette was preceded in death by her husband, William Theodore Queen, infant son, Harold Queen, son, Billie L. Queen; brothers, James “Smitty” Smith, Harold Reed, Jimmy Reed; sisters, Hazel Foxworth and Opal Jackson; and great-granddaughter, Alyssa Burkett. Miss Margarette is survived by her daughter, Margarette June Q. Blair (Widgie) of Mountain Rest, SC,; sons, William T. “Tommy” Queen (Joyce) of Santa Paula, CA, Robert N. Queen (Sandra) of Anderson, SC; brothers, Billy Reed (Ethel) of Orangeburg, SC, Emory Reed (Windy), Mac Reed (Trudy) of Holly Hill, SC, Don Reed (Pat) of Columbia, SC; and sister, Thelma R Garrick of Orangeburg, SC; eight grandchildren, eleven great-grandchildren and three great-great-grandchildren. Services will be Thursday, December 6, 2018 with visitation from 2-3 pm, with the service to follow at 3:00 pm in the chapel at the Sandifer Funeral Home, Westminster, SC. Burial will be at the Salem First Baptist Church Cemetery, Salem, SC. In lieu of flowers, memorials may be made in memory of Miss Margarette to the Oconee Hospice of the Foothills, C/O GHS Cottingham Hospice House, Attention: Foundation Office, 298 Memorial Drive, Seneca, SC 29672 or The Foothills Assisted Living, 999 West Union Road, West Union, SC 29696 for resident’s activities. To send flowers or a remembrance gift to the family of Margarette Elizabeth Smith Queen, please visit our Tribute Store. "Email Address" would like to share the life celebration of Margarette Elizabeth Smith Queen. Click on the "link" to go to share a favorite memory or leave a condolence message for the family.